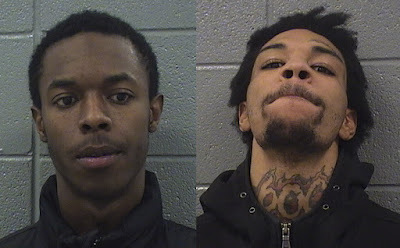 Two brothers are facing multiple charges for allegedly breaking into cars near Wrigley Field and leading cops on a dangerous foot chase across icy streets last week. A resident told police that he saw Navon and Narquist Dukes trying door handles on at least fifteen vehicles in the 3700 block of North Wilton shortly before midnight on January 3. Arriving officers found the two brothers hiding behind a car in an alley, according to court records. A foot chase broke out, and one officer suffered a knee injury while running on icy pavement, police said. The brothers, ages 21 and 22, were captured minutes later and identified by the resident who called 911, according to police. Both men gave police fake names, authorities said and were found with a black tablet that they did not know the password to. At the police station, officers who transported Navon Dukes found a plastic key card in their back seat where Dukes had been riding. Officers later determined that it belongs to a woman who lives on Wilton, they said. Both men are charged with misdemeanor anti-theft laws; two counts of misdemeanor reckless conduct; misdemeanor obstruction of identification; and misdemeanor theft of lost or mislaid property. Navon Narquist has been on parole since September 17 for possessing a stolen motor vehicle and aggravated assault to a police officer, records show. Cook County Judge Anthony Calabrese ordered Narquist Dukes held on a $5,000 deposit bond, and Navon Dukes held on a $10,000 deposit bond. Both men are due back in court this week.